Scientists and conservators at the Tasmanian Museum and Art Gallery (TMAG) have had a unique look into one of the museum’s oldest taxidermy specimens, all thanks to a local vet. Staff at the North Hobart Veterinary Hospital today x-rayed TMAG’s Bengal tiger specimen, which was first donated to the museum by the Australian Museum in 1892. TMAG’s conservators were keen to get a glimpse inside the tiger in order to see the original iron frame used to construct the specimen, with a view to repairing damage to the mounting mechanisms that had accumulated over many years. 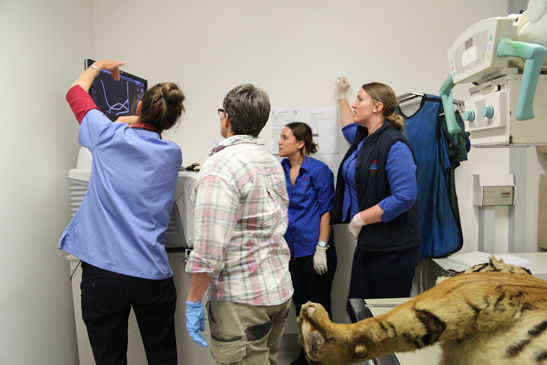 “Today was an important opportunity for us, as we need the x-ray results so we can look after the tiger, and get him in a more displayable state,” Conservator Nikki King Smith said. TMAG Senior Curator of Zoology Kathryn Medlock said the Bengal tiger specimen had an interesting history, and when it arrived in 1892 it was one of a number of shipments that came as a result of TMAG’s Director writing to the Director of the Australian Museum petitioning for donations to fill recently expanded gallery space. “In those days, the museum didn’t have a taxidermist and therefore relied on exchanges and donations to provide the majority of the collection’s mounted animals,” Kathryn said. Kathryn said the Bengal tiger specimen, which was on almost constant display from the late 1800s until the 1970s, also provides an insight into the history of the display of zoological material and people’s changing attitudes on conservation. “In the 1970s, photographs reveal that the tiger had been used regularly for children to sit on to have their photo taken, but was removed from display after public complaints that a significant specimen of a critically endangered species was being used for such a frivolous purpose,” Kathryn said. The x-rays taken today will now be analysed and TMAG’s conservators will begin working on the Bengal tiger, with the possibility the specimen may one day be returned to display – however, not to be sat on for photographs! 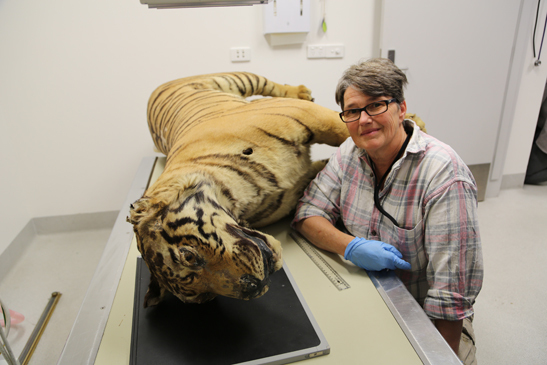 (top) Conservator Nikki King Smith with the Bengal tiger specimen. (middle) The Bengal tiger undergoing an x-ray. 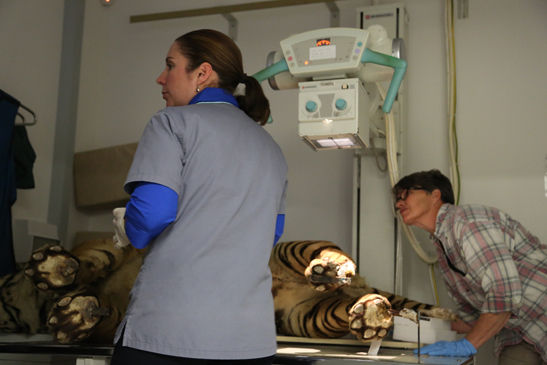 (bottom) TMAG and North Hobart Veterinary Hospital staff examine the x-rays of the Bengal tiger.